Homeownership is an integral part of the American dream. For decades, the biggest investment that most Americans made was in the single-family home in which they lived. It is a truism of personal finance that you should pay yourself (or your bank) instead of your landlord. There is increasing evidence that this attitude about residential real estate is not as pervasive as it once was, and it’s not the Millennials’ fault. The year 2018 marked a shift in the housing market. Ten years after the housing bubble burst and the world’s financial systems nearly choked to death on a diet of toxic mortgages, the trends in the U.S. housing market changed. Data showed that home sales and home construction were deviating from the previous trend. Homeownership rates leveled off after several years of rebounding. More surprising was a change in sentiment that might represent a long-term change in how Americans find shelter. Government sponsored enterprise Freddie Mac conducts a semiannual survey of renters across the full demographic spectrum that is called “Profile of Today’s Renter.” The 2018 report, which was released on October 17, included some surprising – and conflicting – results that help explain both the resilience of the U.S. apartment market and the sluggishness of the housing market. The report’s headline conclusion was that the perception of the affordability of renting had risen sharply from February. According to Freddie Mac’s survey, 78 percent of renters believed renting was more affordable than owning. That was an 11-point jump from six months earlier. While multi-family observers tend to credit the lifestyle choices of the younger generation with the boom in apartment living, the Freddie Mac report showed that more respondents from all three major demographic cohorts said that renting was more affordable than owning. Millennial renters reported the largest jump in the perception of affordability, going from 61 percent to 75 percent, but 77 percent of renters who are of the Gen X demographic group saw renting as more affordable than owning (up 11 points). And 88 percent of Baby Boomer renters held that renting made more sense than owning. The confounding result of the “Profile of Today’s Renter” was the increase in the number of renters who said they were experiencing problems making their rent payments. Two in three renters reported having trouble meeting their rent in the past two years, significantly more than the 43 percent of home owners who admitted to the same problem with their mortgage. Digging into the details of this data finds that the increasing difficulty in making rent was dramatically higher for renters in rural areas, where 77 percent said that rising rents had impacted their decisions about buying essential items, like food or medical care. Also, the hardship was highest – an overwhelming 88 percent – among workers in so-called essential industries, like education and healthcare. Workers in this group of respondents also reported that the difficulty with higher rents forced them to live further from their workplace than they wanted. These results point to some of the structural problems facing the demand side of the housing industry. Structural problems with supply are some of the reasons why rents have risen, and so much new apartment building has occurred. Now, as lenders have become gun-shy about apartments and rent growth has slowed, it’s clear that demand for apartments will remain steady at worst. A third, equally conflicting, result of the Freddie Mac survey points to support for demand going forward. Satisfaction with the experience of renting remained steady, with 63 percent expressing satisfaction with apartment living. Fewer renters believed that it would be more affordable to buy in the coming 12 months (41 percent now versus 46 percent in February). And, despite the growing problems with meeting rent payments, the number of renters who said they expected to rent again in their next residence also jumped 11 points, to 66 percent. The government’s November 20 reading on the housing market validated this change in trend and the underlying concerns. 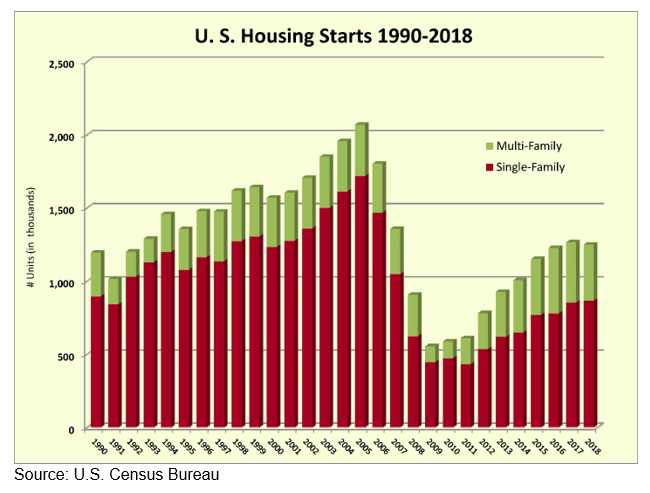 While the Department of Commerce reported that housing starts had risen 1.5 percent to 1.228 million units (seasonally-adjusted), the increase was driven by a stronger multi-family market. Construction of single-family units fell again in October for the second consecutive month, declining to 865,000 units. Of greater concern was the fact that the year-over-year trend was 8.8 percent lower. The start of 948,000 single-family units in November 2017 remains the high water mark of the current business cycle, which began in 2009. For most of the past two years, the housing market has been constrained by supply problems that stem from land availability and regulatory changes that make residential development less attractive. Land and labor shortages have led to tighter inventories, higher prices, and fewer new home starts than expected. Now the rising costs of borrowing are adding to the structural supply problems. The 30-year fixed mortgage rate hovers near five percent, a seven-year high. Wage growth has picked up, but remains more than two percent lower than house price inflation. If the demand for homeownership hadn’t picked up before 2018, the trends in affordability and supply aren’t likely to reverse the decline. More than twenty years of government intervention and tinkering with the mortgage market – across three U.S. administrations from both sides of the aisle – have wrecked the norms for the housing market. It was reasonably assumed after the mortgage crisis that began in early 2007 that there would have to be an extended period of readjustment for the housing market to respond to the housing bubble and excess inventory that followed. Dire forecasts at the time suggested that the housing market might remain depressed until 2014. It turned out those expectations were on the money, but this current trend goes well beyond an equal and opposite reaction to the mortgage crisis. The U.S. housing market has always been subject to the rhythms of the economy and demographics. That made the housing market predictable. There were still cycles of overbuilding and retrenchment, but those resulted from too much optimism, poor judgment, government intervention, or a combination of the three. The basic understanding of housing demand hadn’t changed since World War II. Some 70 years later, the foundation of the housing market may have shifted. Of the major forces constraining the housing market, rising interest rates are the most immediate concern, and also likely the most temporary. Borrowing costs are significantly higher than two years ago, but they also dramatically lower than in recent U.S. history. As rents push higher, the short-term difference between paying rent and mortgage will disappear. Low inventories and shrinking workforce present tougher challenges to growing supply, which would help ease the rate of home price appreciation and improve affordability. All of these conditions will change at some point. The unresolved question is whether improvements in affordability will improve demand. Data from October suggests that many markets are continuing to see higher-than-normal appreciation but some of the biggest housing markets, Dallas in particular, have begun to see prices flatten and market indicators – like days on the market and multiple offers – cool off. Thus far, the Trump Administration has shown little interest in the housing market but it has yet to face a slowdown in the economy. Its zeal to tear down regulations has eased some of the constraints that Dodd Frank placed on residential financing, but many of the restrictions remain and lenders have expressed little interest in rushing back into residential development. Perhaps a downturn will move the government to stimulate demand but, until such a turn of events, demand for homeownership seems unlikely to grow. A November 27 decision to allow Freddie Mac and Fannie Mae to increase the maximum dollar amount of the mortgages they issue by about $30,000 may be an indication that the government is seeing affordability as an impediment to demand. The cycle of the U.S. housing market relies upon demand from a younger generation replacing the fading demand from the aging generation. Young people marry and start families, which is a major factor that pushes renters into buying. Perhaps the Millennials and the emerging Generation Z will revert to form and begin to buy homes as the Boomers fade further in the 2020s, but the ever-declining birth rates suggest that this is not a given. It seems as likely as not that the U.S. is seeing the beginning of a shift in the mix of housing that its households demand. Such a shift occurred after World War II, when U.S. population boomed and the move to the suburbs ensued. The conditions of the housing market today are occurring against a backdrop of social factors, like New Urbanism and sustainability, which are slowing population growth and suburban expansion. Expect the demand for homeownership to slow as well.